I've always wanted a cute little pair of crocheted shorts, so in the made rush of crocheting I did before my trip to Hawaii, I whipped up a pair. (Literally, I worked on these like a mad woman and finished them in 3 days, including an extra trip to walmart when I ran out of yarn). The after seeing a few great shorts patterns in the nominees for the 2015 First Quarter Flamies in the best pants/shorts category, I went to ravelry and found the Pineapple Lace Bikini Shorts by Heritage Heartcrafts. I forked out $5.99 for the pattern but it was well written and worth it. I worked these shorts up in Red Heart Luster Sheen, a fine weight acrylic yarn made to feel like cotton, in the violet colourway. I worked with my F crochet hook and used about one an a half skeins of yarn. To make these shorts you crochet a series of circle motifs and connect them to form the waist, then crochet the pineapple motifs downwards, and shape the legs of the shorts. I think I deviated a tiny bit from the pattern here, omitting one or two rows at the end. The great thing about crochet is you can try your garment on as you're working on it and make adjustments on the fly. Once the bottoms are done, you add some extra circle motifs in the back to make sure you're assets are going to be fully covered. Finally, add a waistband and draw string and you're ready to rock a super cute pair of beach shorts. This is the last of these posts, I swear! (Well at least until Wanderlust Whistler this summer). Okay, by this point you all know I attended Wanderlust in O'ahu at the end of February. While I was there I camped on the beach, and decorated my site with some crochet. I've already shared the Half Lotus Bunting in the foreground, and the maple leafs in the midground. So now I'll take a minute to show off the Doily Bunting in the back ground. 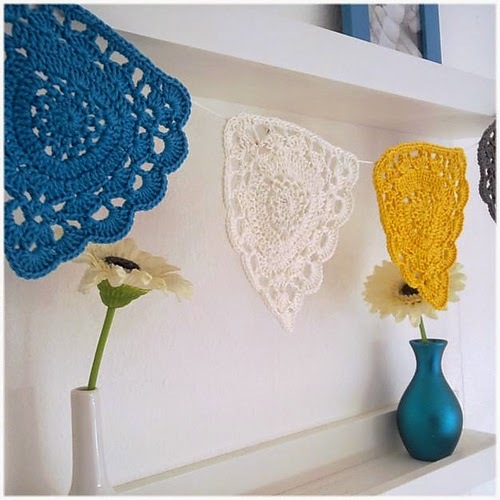 The pattern is the Crocheted Doily Bunting by A la Sascha (ravelry link) and is available for free on her blog "Let's Yarnify". In her version (shown above) she does a short garland in blue, white, yellow and grey, but I knew I wanted mine to be long enough to string around my entire camp site. Since of course this project would be going outside, I grabbed some colours in acrylic Bernat Satin, a 5mm hook, and got too it. I made most of the pennants on a quick trip to Thunderbay in January, small crochet pieces like these are great for working on airplanes. And the pattern is straight forward enough that once you've made one or two you can work it from memory. When I got back to Calgary, I spent an afternoon tucking in ends and crocheted the whole thing together on a chain. 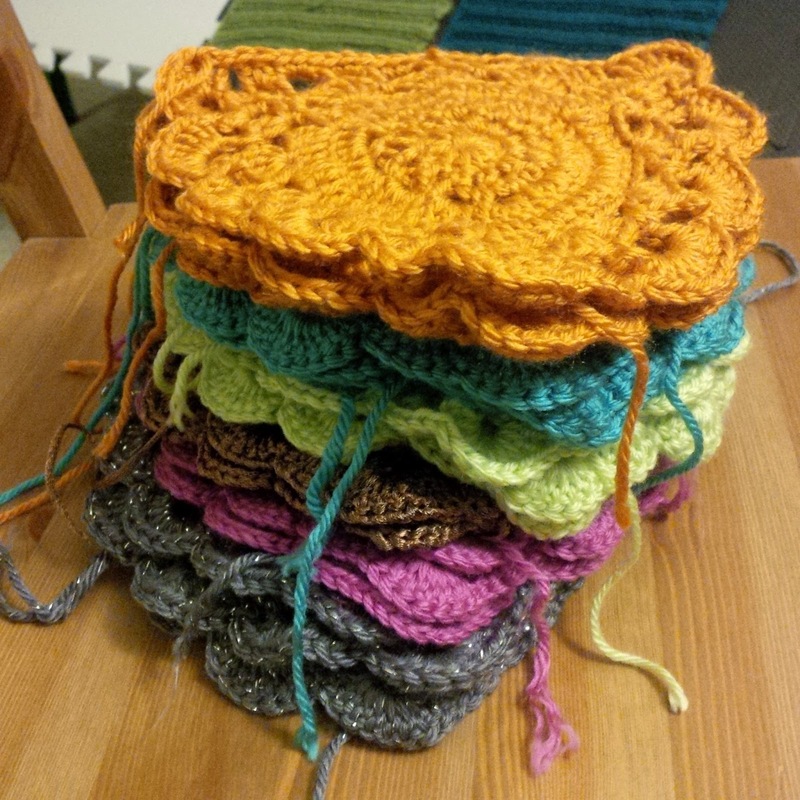 I got three flags from each skein of yarn, and worked them in 6 different colours. They looked great hung around my campsite, and held up despite all the wind and rain we had that week. Now they run the full length of my apartment above my book shelves, and I can't wait to take them camping again this summer! I had to make sure I snapped some pictures of this before I spun it all up. This week I popped down the highway into Cochrane, Alberta to visit Legacy Studio. Theoretically I was going specifically to pick up a pair of hand combs, but you can't put me into a room with all that fibrey goodness and expect me not to buy some. 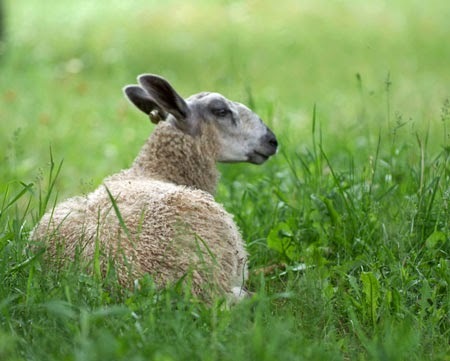 And this time it was Bluefaced Leicester, and does it ever spin up nice and easy. 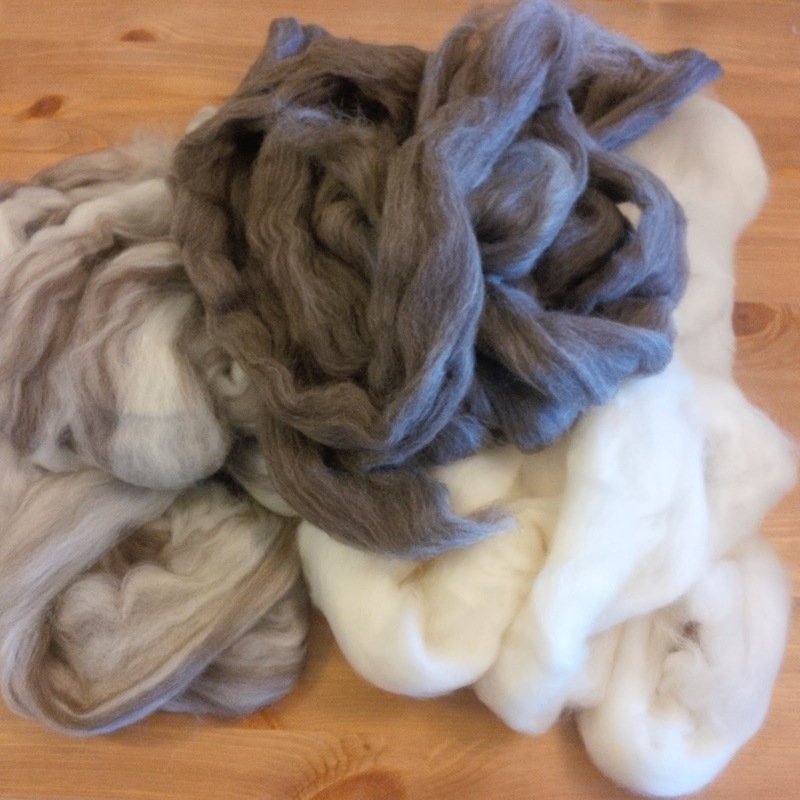 I decided to resist the temptation to dye the fibre, and rather embrace the natural colours, picking up 100g each of white, black and oatmeal. Isn't it pretty? So soft and fluffy. 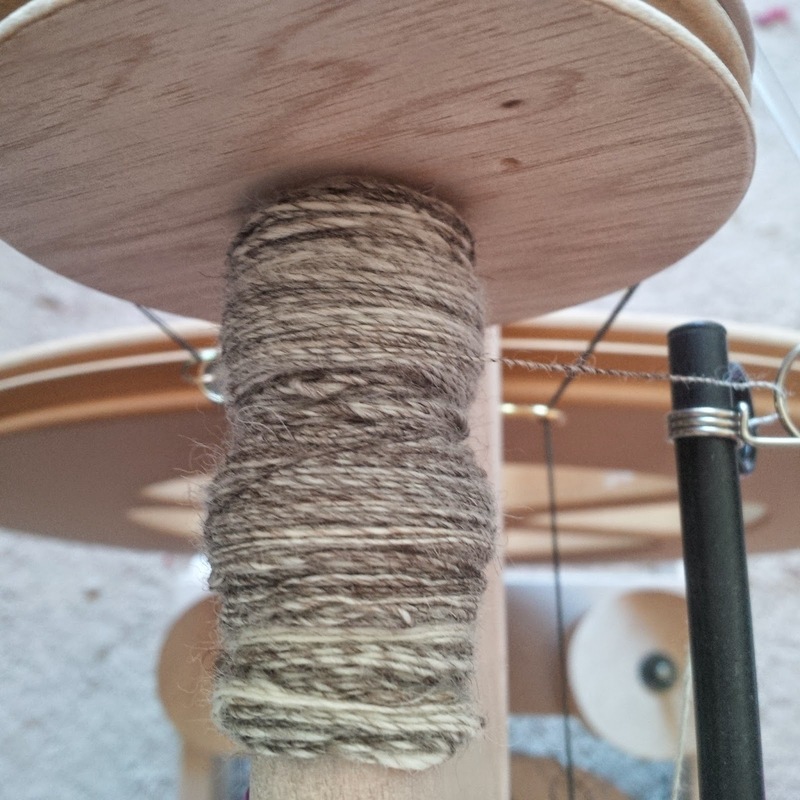 The plan is to spin up a lace weight two-ply and knit a shall with it. 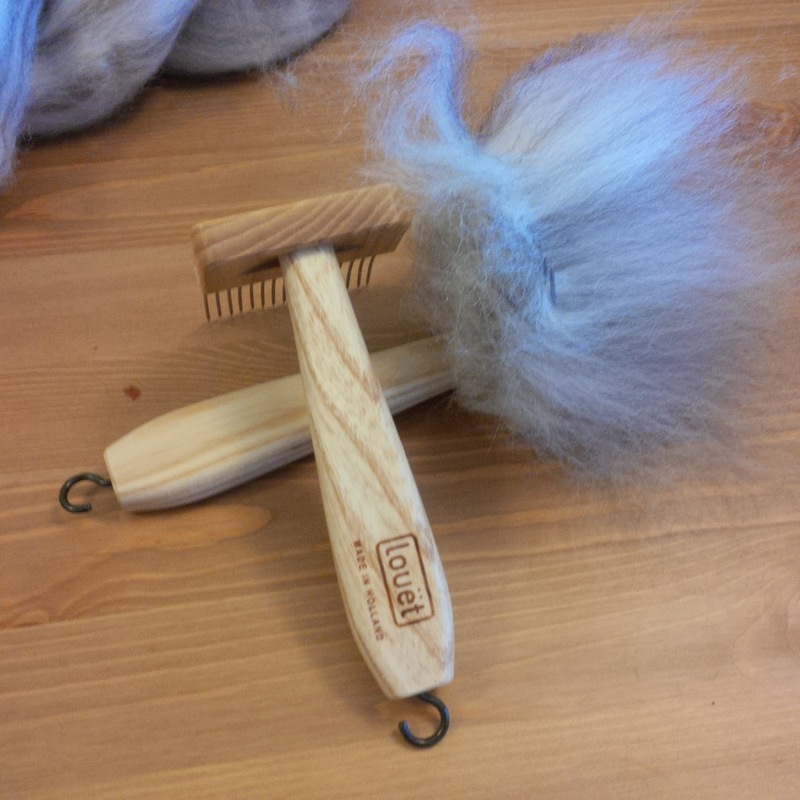 Here are the louet mini combs, loaded with some fibre. You can spin directly from the combs (I'll have to put together a video demo of that soon). 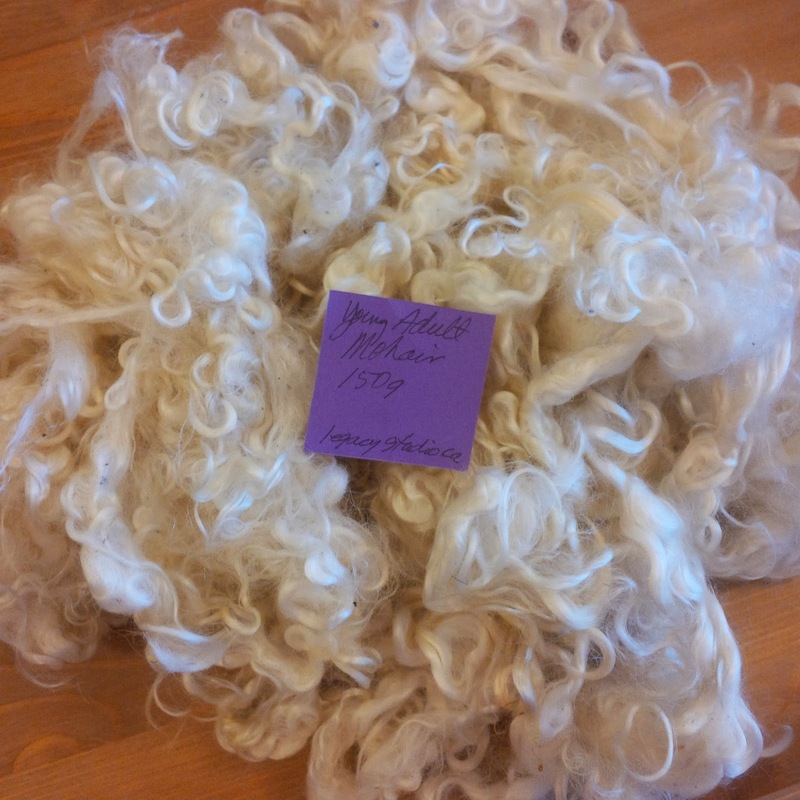 And here is some of the spun, oatmeal BFL, as a single. The long soft fibres spin so nicely. I also picked up some mohair locks. I've never spun from locks before. The plan is to dye them and then core spin them I think! Anyways, Legacy studio is great! You can shop online, or visit in person. They'll also be a vendor at Olds Fibre Week, so be sure to check them out! The best thing about Easter, if you're into Dyeing yarn that is, is all the leftover dye in bright colours that's around afterwards. 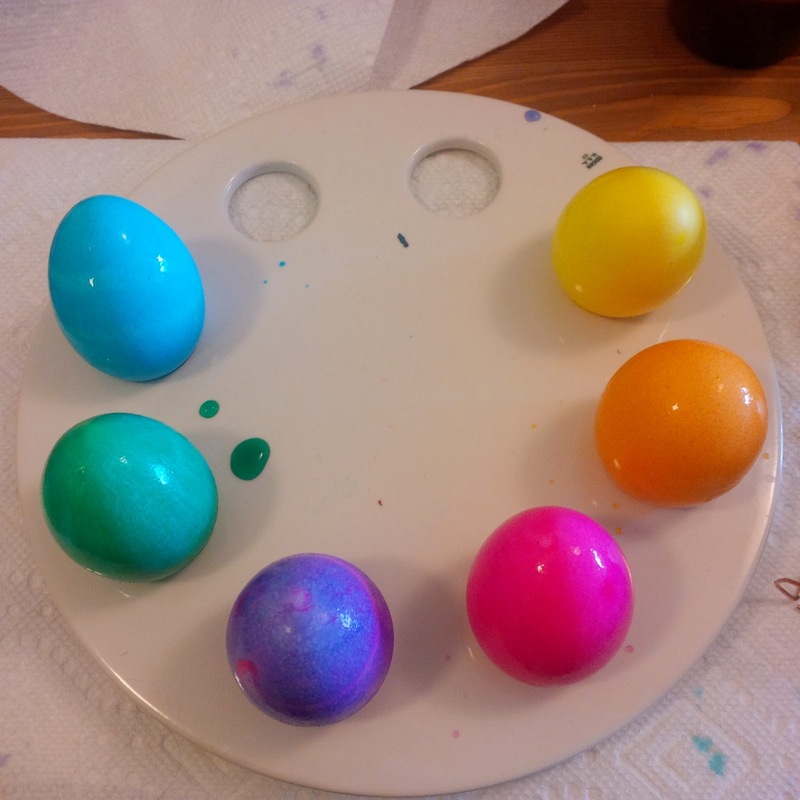 You can usually find egg dyeing kits after the holiday for as little as a dollar. 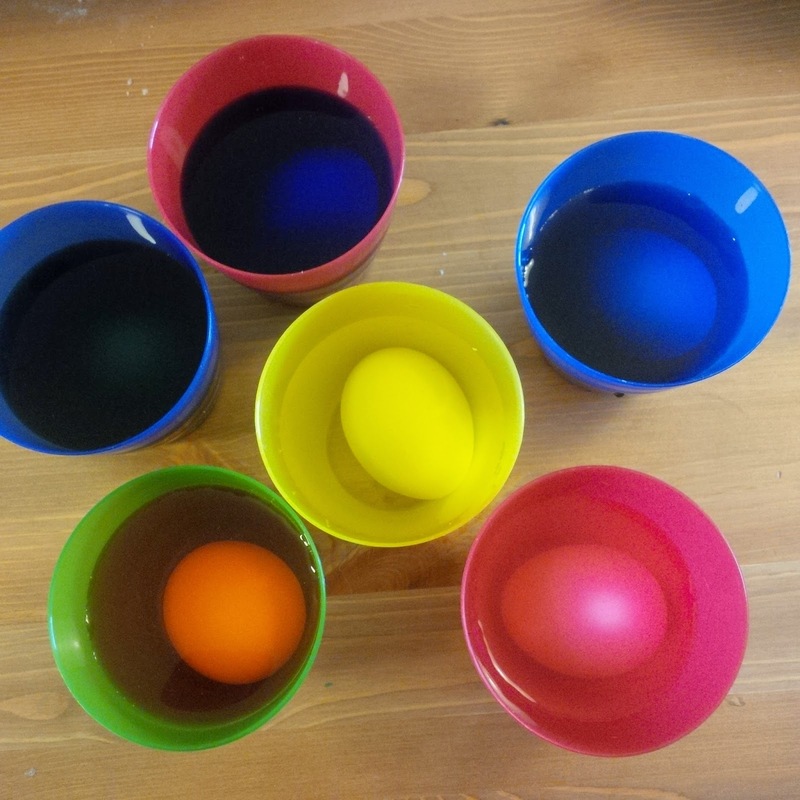 And those kits contain enough acid-reactive dye to colour a fair amount of yarn, even after it's been used on eggs. I mixed up the dye pellets according to the package directions. Dissolved 1 pellet in 1 tbsp of vinegar, once fully dissolved I added half a cup of warm water. Added my eggs and voila, beautiful, vibrant colours. No heating necessary. Under the acidic conditions, the food color in the pellets binds to the proteins of the egg shell. Now just to get it to bind to the proteins in my yarn. I used a skein of recycled yarn, 40% wool, 60% acrylic I believe. And while the acrylic wont pick up any of the color, there should be enough wool content to still get a nice vibrant yarn. I pre-soaked for only about 10 minutes, and wrung out my yarn (this step is important, you don't want the yarn fully saturated, you want it to be wet to break the surface tension, but still ready to soak up your dye). If you were using 100% wool, you might want to be careful about wringing out the yarn to get the excess water out (try a salad spinner?) to avoid felting, but since this is a blend, it was ok. Then I spread it into a roasting pan and began pouring my dye onto the yarn. 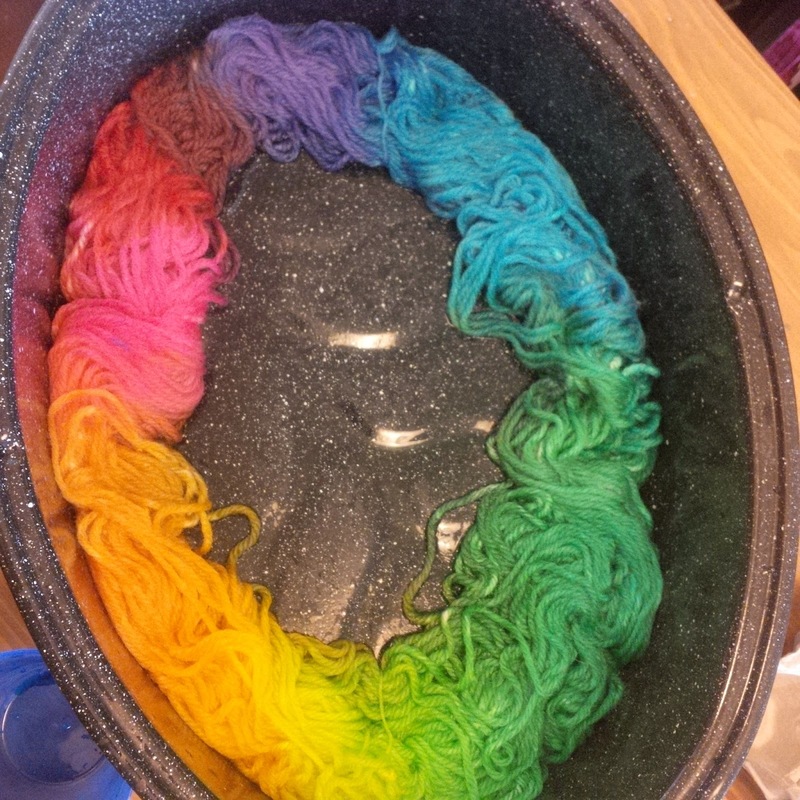 I used paper towel to absorb any liquid that the yarn wasn't, since I didn't want my colours to bleed across the pan. I also arranged my colours according to the colour wheel so adjacent colours could blend into each other without muddying. Then I popped the pan (with the lid on) into the oven at 100'C/225'F for about 20-30min. Remove from the oven and let cool to room temp before rinsing (again you don't want to risk shocking your yarn and felting it). I don't have any of the pictures of the finished yarn with me, so I'll edit them to the post later, but the finished result looks great! This was my first go at dyeing in the oven, and I can't wait to give it another go.